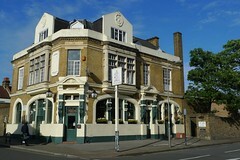 A lively and comfortable pub near Tooting Broadway Station, just off the main road. This is a large place with several rooms which has been refitted in a sensitive way, with plenty of wooden pews and tables. There are two large rooms inside, with the bar stretching between them, as well as smaller side room with couches and bookshelves which would seat about six to eight people. There's a sizable conservatory area at the end of the bar leading to a very large beer garden area, with plenty of tables for seating and popular in the warm summer evenings. The garden has a sign saying no children after 8:30pm. Although this is largely a residential backstreets pub, it's also near a large hospital and offers 10% discounts to NHS staff before 9pm on drinks and food, so it has an eye to serving its neighbourhood. On Ewan's Wednesday evening visit, the place had plenty of customers, but being so big, still had lots of space for seating. The bar has three handpulls for ale, serving Tribute and Wandle on a May 2009 visit. They also have draught Staropramen, Hoegaarden, Addlestone's cider, and other familiars. They advertise a Thursday pub quiz, free entry. There is a board game night twice a month on a Monday (link). There is also a twice weekly Montessori music class for under 4s. secretlondon visited one Saturday in May 2016. There are now three handpumps with Sambrook's Junction, By The Horns' Stiff Upper Lip and Purity's Mad Goose on my visit. Pints were about £4. They had two meantime beers on keg, and some others I forget. The food is definitely gastro puppy (see menu and on my visit had started running two separate food ventures with a asado barbecue to be eaten in the garden. Mains were £12 ish. I had some food from the barbecue as we'd been admiring the suckling pig they were cooking. It was £12.50 and came on a board with corn tortillas, sweet potato and salad. The conservatory is nice and the garden lovely with picnic tables and grass. Last visited by secretlondon, May 2015. Food times taken from menu in pub, May 2009. Last edited 2016-06-20 12:53:27 (version 10; diff). List all versions. Page last edited 2016-06-20 12:53:27 (version 10).